An important town in Aquitaine since Roman times, Saintes is pleasant, pretty, and easily visitable—a fine stop for a half day or overnight. The city of Saintes, 41 km (25 miles) southeast of Rochefort and 28 km (17 miles) northwest of Cognac (map), takes its name not from Christian saints but from the Romans—it was known as Mediolanum Santonum in Roman times. Set amidst forests and fertile farm country, Saintes was the capital of Roman Aquitaine, and was an important government center until after the French Revolution. Although La Rochelle later took on this role, Saintes is still a judicial center for lawyers and courts. 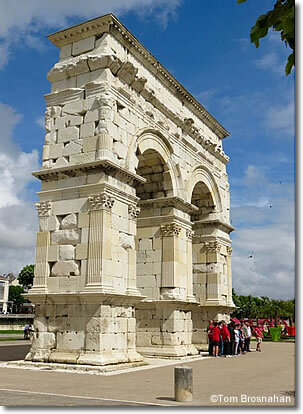 Arch of Germanicus, Saintes, France.